Last night Carolyn and Meredith rested in Palas de Rei. Are you praying for them? Need to keep up the prayer support they have a long way to go yet. What can we say about Palas de Rei? 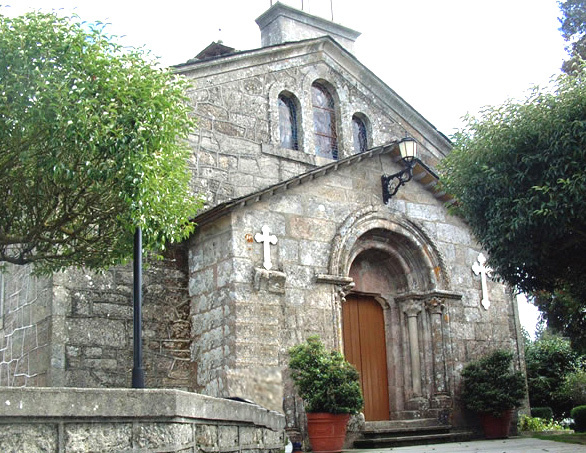 To start, Palas de Rei name is derived from the Witiza the Visigothic king, Witiza who who had a palace built to hold court. Palas de Rei means, “The Palace of the King in Gallego.” The town has also hosted as its inhabitants the Celts and Romans. The town is an important piece of European history, especially to art historians, due to its many abundant examples of Romanesque architecture. An interesting example of a typical Galician Ayuntamiento or Town Hall. Where would you go for the Divine Liturgy? Church of san Tirso of course! The Church is dedicated to Saint Thyrsus, who is venerated as a martyr. The Roman Martyrology has it that he died for his faith during the persecution of Decius in Sozopolis (Apollonia), Phrygia. Tradition also has it that Sts. Leucius (Leukios) and Callinicus (Kallinikos) were martyred with him and that Thrysus endured many tortures before being sentanced to be sawn in half. Turns out that the saw did not cut him because his executioners miraculously could not lift it. Saint Leucius, was hanged, harrowed (instrument with multiple plow blades on it) and then beheaded by the governor Cumbricius,. 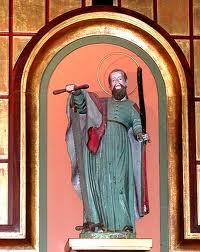 St. Callinicus was a pagan priest but converted after seeing the martyrdom of Thyrsus. He too was beheaded. Thyrsus’ relics reside in Constantinople (some are now in France as well). During the Middle Ages devotion to him was so great that Thyrsus had a full office in the Mozarabic liturgy. Thyrsus is thus the titular saint of the cathedral of Sisteron in the Basses Alpes and the Cathédrale Notre Dame et Saint Thyrse. As such, Thyrsus is thus the patron saint of Sisteron. Carolyn and Meredith, our prayers go with you! Make sure everyone visits their blog.